Cloud computing continues to grow in Australia. In 2013 the International Data Center (IDC) reported 86% of Australian companies are using cloud computing in some way, this was up by 71% for 2012, a significant increase in anyone’s language. In 2014 an IBISWorld Market Research Report has 438 businesses offering cloud technology, employing 1,588 staff and generating revenue of $601 million. A growth industry. SiliconANGLE an independent media company in January 2014 compiled this list of twenty Cloud Computing statistics which they believe every CIO should know and use when proposing a move to the Cloud. These statistics are based on the USA experience but with IDC predicting the Australian public cloud services market will grow to a whopping A$2,671.9 million in 2017, meaning a compound annual growth rate of 24.7% for the 2013-2017 period, they are applicable to the Australian experience. With increasing amounts of data requiring storage and an increasingly mobile workforce, the CIO needs to implement a safe, accessible, cost effective solution to address these and other emerging issues. Deploying additional onsite storage systems may no longer be cost effective. A hybrid solution could be an effective entry to Cloud Computing, retaining highly sensitive data onsite, while storing the remaining data in a data centre. These statistics show Cloud Computing has gone far beyond being an emerging technology, given the take-up across the board. While this technology is not a new concept, over a decade ago Application Service Providers were in a similar space, the focus has now shifted to data processing and communications, along with software services and the transition to the Cloud requires a shift in business strategy and policy. 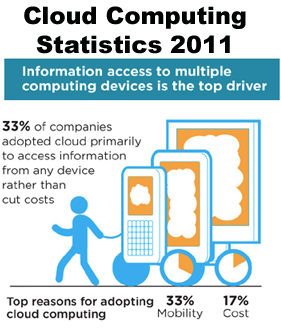 The above numbers can be used effectively to demonstrate Cloud Computing as a valuable business tool.